Perfumes that look (and smell) like diamonds (if they had a scent). Spicy, woody tributes to the English aristocracy. Gender neutral fragrances. And a French luxury fashion house’s return to the world of fragrances after almost two decades. 2018 is scent–sational and we have our favourite fragrances to prove it. 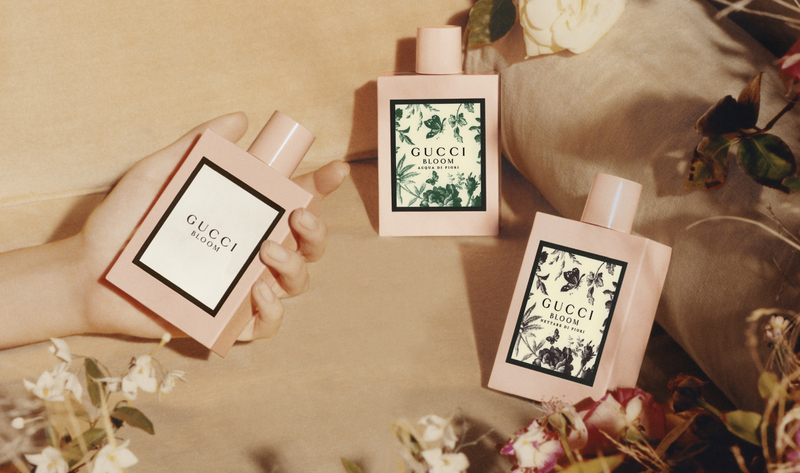 The third installment of the Gucci Bloom collection is quite unlike previous editions. The bottle is a sure indication — while it’s packaged in the same powder pink bottle as its predecessors, it sports a black Herbarium print on its label appliqué. : A sign of the scent’s intense, new direction. At first spritz, Nettare di Fiori immediately introduces its wearers to its spicier take. Rose is its opening note, and sharp ginger follows after, lightly melding with the Gucci’s Bloom original blend of fresh tuberose, jasmine and powdery rangoon creeper. Woody, mossy accords of patchouli, leathery osmanthus and musks rounds off the scent. If diamonds had a scent, it would smell like Carat: Cartier’s newest perfume launch. The perfume is a fragrance interpretation of diamonds with both its scent and appearance. Perfumer Mathilde Laurent unites seven fresh flowers with colours of the rainbow — violet, lily, hyacinth, ylang-ylang, narcissus and tulips — to create a pure scent that embodies a diamond’s light. To capture the light, the scent is packaged in an Art Deco-inspired bottle with clean-cut glass facets. Few scents look as good on your dresser as the Penhaligon’s Portraits collection — each bottle is stopped with a brass animal head, embodying the personality of its aristocratic character. Two more illustrious scents have been added to the collection: Constance and Mister Sam. While Constance, with its fresh and spicy scent, is a modern take on feminine fragrances, it’s Mister Sam that’ll keep them guessing for women who prefer masculine scents. Embodying the loud-talking American in London, Mr Sam is a warm and inviting concoction featuring cardamom, cumin, black pepper, patchouli and cedar wood. 19 years: That’s how long it’s been since Dior released a new fragrance. Its return to the scent world is marked by joy, a reference to the French design house’s key tenet of “making women not only more beautiful but happier”. Described as milk and honey on velvety skin, the scent is a vibrant blend of florals, fruits and musk. It’s softness and energy; it opens with bergamot, mandarin and rose blossoms and fades to a subtle, powdery freshness thanks to creamy sandalwood. Any fan of Chanel perfumes is well-versed in the luxury house’s fragrance wardrobe of typically rich scents. That’s where Les Eaux differs — it’s a collection of unisex, light mists with refreshing, citrusy scents. The Paris Deauville, in particular, is a storied scent that’s almost unexpectedly fresh. Inspired by Deauville, the lavish seaside town of Normandy that spurred Coco Chanel’s fashion behemoth, it exudes a startling lightness. Savoury and woody basil opens with zesty Sicilian Mandarin as its top notes. Petitgrain maintains the vivid citrusness while jasmine keeps the scent crisp and light. Patchouli lingers as its musky-earthy base note. Lancome’s La Vie Est Belle is unabashedly feminine — its scent is best described as a delicate flower bouquet. Four flowers make up its main notes — peony, rose, jasmine and lily of the valley — with each representing different facets of happiness. It opens with juicy green pear and unfolds into the bouquet before gently lingering on the skin with base combination of sandalwood and musk.